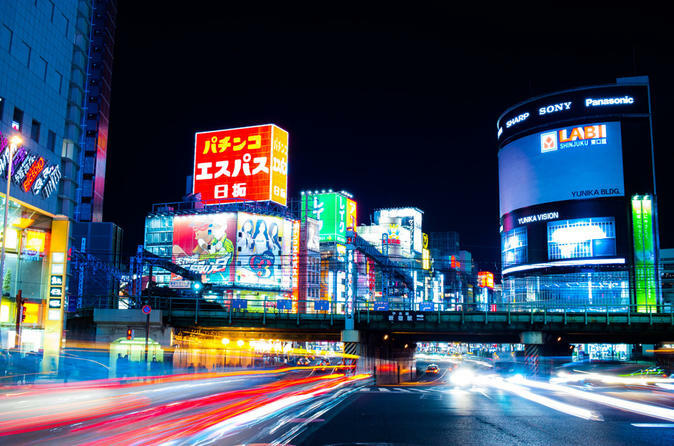 Join your small group of night photographers at the Odakyu Department Store (Odakyu Hyakkaten) in Shibuya, and embark on a colorful journey through Tokyo after dark. Start by getting acquainted with camera techniques on how to aim, set up your tripod, or use long exposure to your advantage in low light. Feel free to bring a zoom lens or wide angle lens to play around with when you're setting up a shot. Spend the first hour in Shinjuku, a large entertainment complex centered around the world’s busiest railway station. View Tokyo’s tallest buildings in Shinjuku’s skyscraper district while your guide offers composition tips and shares insider knowledge of the city. Here, you might set up your tripod and test your skills at long exposure as you capture shots of passing cars. After snapping photos of night cityscapes, alleys, trains and traffic, take a 10-minute train ride to Shibuya (own expense). Spend another hour in this colorful district, known as Tokyo’s center for youth fashion and culture. Focus your lens on the crowds of people passing by neon-lit entertainment, dining establishments and nightclubs. Spend your last half hour at Shibuya Crossing — a spot made famous by the 2003 movie Lost in Translation — where throngs of pedestrians flood the streets. Your tour concludes at Shibuya station, surely with plenty of new images to share with your friends and family.